On weekdays, provided trains are running to schedule, there is currently a 2 minute transfer either way, from the Central Coast train to the all-stops to Berowra train, which occurs because the Berowra train waits for 6 minutes or so at Hornsby. In the new timetable, in order to catch the central coast train, you would now catch the train going to hornsby ( not berowra ), and have a seven minute change. And people going from Strathfield to Mt Colah would have an 8 minute change, to the next Berowra train. That's slower, but not too bad. And it is a time improvement for people actually going on the all-stops train to Berowra. On the weekend, on the other hand, the north shore line trains appear to arrive at hornsby at the same time as the interrurban. That effectively would mean you need to catch the north shore line train 15 minutes earlier, and then wait 15 minutes at Hornsby. That is definitely not an improvement at all. Travelling in the opposite direction, there is usually a 13 minute delay between getting off a train from Gosford, and catching a train along the north shore from Hornsby. At the times which I sometimes do this, the delay now looks more like 6 minutes. Travelling from the north shore line to Pennant Hills, interchange time at Hornsby reduced from 14 minutes to 12. This is good, because it means that you no longer see the preceding train towards Pennant Hills creeping out of the station at Hornsby just as the train from Waitara is arriving. That is all wrong, please check the timetables again. Currently on weekends, there is a 2 minute connection from the central coast train to the all stations to Berowra train - under the new timetable, this will increase to 14 min, which will at least improve reliability and I can handle this trade-off. Currently on weekdays, there is a 7 minute gap - this is unchanged under the new draft timetable. The problem I have with the new timetable is the weekend connections from stations between Berowra to Hornsby to western Sydney as I mentioned in my previous post - for example, Asquith to Strathfield/Parramatta etc. Currently, the T1 Berowra to the city train arrives at Hornsby 4 minutes before the intercity arrives, making an easy connection. In the new timetable, the intercity arrives at Hornsby 7 minutes before the all stations from Berowra - a 23 minute wait for the next express. Even if you take the all stops to Epping (with a tight 1 minute connection at Hornsby), you will need to change again at Epping to another all stopper with a 12 minute wait - arriving at Strathfield 2 minutes before you would if you waited 23 min at Hornsby for the express. Also, Asquith - Central on weekends currently takes around 44 min by changing to the central coast train at Hornsby - under the new timetable, this will increase to 55 min as there will be no express connection available. 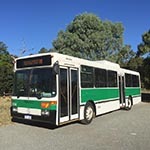 This is clearly a huge downgrade in service for passengers from Asquith/Mt Colah/Mt Ku-ring-gai/Berowra on weekends, adding 20 minutes to journey time when travelling out west and 10 min when travelling to Central (or, for Berowra, a reduced frequency for express trains available from 1 every 30 min to 1 every hour). andy_centralcoast wrote: The other thing that surprises me with the weekend timetable for T1 is that journey times remain the same, and the large dwell times at North Sydney and Chatswood haven't been reduced. I've been on trains that arrive 3 minutes early into those stops on weekends and it looks like that's set to continue. This thing is still a draft TT. Still a few months away for things to be ironed out. Newcastle Flyer wrote: Still no faster express, such as the 08:00/08:04 weekdays that was removed by the Liberals under "Back Flip Barry". . . .but can't be bothered re-introducing a "fast express" (or redoing an exiting service as a fast express) from Wickham - Central. I have to take that back - well half take it back. Their are now two "faster expresses". In reality they are only altered services & a re-introduced & re-extended service. Their is again, an equivalent of the 0800/0804 weekday "Newcastle - Central" train, but 3 hours earlier,! Leaves Wickham at 0503, stopping at Hamilton, Broadmeadow, Morisset, Wyong, Tuggerah, Gosford, Woy, Woy, Hornsby, Epping & Strathfield. T8 line; I've noticed something that may exist in this draft format for some reason and will hopefully be rectified for the public timetable. - up: all stops from Revesby departs before the limited stops service from Macarthur arrives forcing customers to wait for the next all stations service. - down: all stops to Revesby service arrives at Revesby at the same time that the limited stops service to Macarthur departs from Revesby. simonl wrote: You don't want passengers at Wynyard for stations beyond Parramatta having to use services from platform 3 and 5. Annoying! Sure, Granville suffers this problem and so does Strathfield but Parramatta bound will ignore the slow services. Granville, Lidcombe and Strathfield probably get enough frequency that it doesn't matter so much. Specific departure platforms wouldn't be of any major concern in my opinion. I'm more interested in any potential delays caused by late running Inner West Line services arriving at / departing from Parramatta station, where all four platforms are used in regular service on a corridor with a reasonably frequent service on both track pairs. I'm particularly concerned about what would occur if peak services get delayed on one sector. I suspect that most of the trains heading beyond Parramatta will be using platform 2. Cumberland line can't so we might see all stations to Blacktown trains using platform 4 with them. Similar to what happens now, it isn't a big problem. I definitely disagree with your assertion that specific departure platforms shouldn't be a concern. Liamena wrote: Well at the times I was looking, Granville is not serviced by T1 trains any more, at all. Righto, doesn't change my point. On the weekend, during the middle of the day ( except the hour when the XPT runs ), the northbound central coast trains are at Hornsby at 22 minutes and 52 minutes past the hour. The all stops to Berowra via North Shore line trains, according to the timetable, arrive at Hornsby at 19 and 49 minutes past the hour, and wait 5 minutes at Hornsby, departing after the central coast train has gone. When the trains are on time, this allows passengers from the north shore line to change to the central coast train, and also allows passengers from the central coast train to change to the all-stops to Berowra train. The trip planner does not recommend doing this, but I have made this change, successfully, literally dozens of times. The trip planner suggests you catch an earlier train to Hornsby and wait 18 minutes. Unless I absolutely have to make sure I get onto that train, I am not inclined to add 25% to the total travel time to Gosford, every trip, to do this. The only time that I can recall it being time-critical, the central coast train broke down and I was late anyway. The proposed new timetable for the central coast line has northbound trains departing from Hornsby at 23 and 53 minutes past the hour. The timetable looks pretty much identical to the current one. The proposed new timetable for the north shore line on weekends, has swapped around the timing of the trains to berowra, and the trains which terminate at hornsby. The trains which terminate at hornsby will arrive there at 21 and 51 minutes past the hour, and the trains going to berowra at 6 and 36 minutes past the hour. This means that the all-stops to berowra trains won't be running right behind the central coast train any more. I suppose that in theory, the 2 minute change from the north shore line to the central coast line will still be possible. It's 3 minutes in the current timetable, 2 minutes in the new timetable. As you say, transfering from the central coast train ( from strathfield ) to the all-stops to berowra train will henceforward be about 14 minutes delay. I don't think it will be more reliable than it already is. Even when the train from strathfield is running late, I have never observed the all-stops to berowra train leaving hornsby before the central coast train has arrived and departed from hornsby. So the current quick change from the central coast train to the berowra train seems to be pretty much guaranteed, as long as you don't muck around. The difference between a 60 minute trip and a 75 minute trip from the mid north shore to gosford is not insignificant, when compared to driving there, it is the difference between being reasonably competitive, or not. simonl wrote: I suspect that most of the trains heading beyond Parramatta will be using platform 2. Cumberland line can't so we might see all stations to Blacktown trains using platform 4 with them. Similar to what happens now, it isn't a big problem. Platform 3 will also be used for West bound trains, platform car markers have already been mapped out. So Platform 3 will be used as a timetabled bi-directional platform. I think you may have misunderstood me. What I meant was that in this case, having Inner West Line services to Parramatta leave from Wynyard 5 and Western Line services leave from Wynyard 3 wouldn't be of great concern. This is because passengers who wish to travel from the City stations to Parramatta and beyond would highly unlikely be interested in catching an all-stops Inner West Line service. Even during evenings and weekends, the frequency of limited stops services to Parramatta is such that the all stops service would be irrelevant to the said passengers. Also, let's not forget that in the past, there were all stops services to Blacktown via Strathfield that departed from Wynyard 5 and all stops services to Blacktown via Bankstown that departed from Wynyard 6. This timetable is essentially just trying to get whatever it can out of the Western Line and South West, with everything else just working around that. I think next years timetable will be the big change for the Northern, North Shore and CCN, with the ECRL shutdown and the Hornsby Junction remodelling coming online. No quoting full post - makes it hard to read & takes longer to scroll. andy_centralcoast wrote: Based on that draft, there appears to be very minimal change to the Central Coast & Newcastle line, and T1 North Shore. I'm quite surprised that the timings of the Gosford/Wyong via Gordon morning peak services (which constantly get delayed and diverted) have not been adjusted. If you mean the 07:39am weekdays, that starts from Hamilton & will start from Wickham (Hamilton - Penrith via North Shore. Good it still goes via the North Shore, but could be adjusted south of Gosford. rogf24 wrote: Eastwood has been dumped for some services, seems it hits weekends in particular. Only on the weekends. As I stated previously, should apply to weekdays as well. Liamena wrote: So, in large parts of the day, there is only one train every 30 minutes going west from Homebush. Other times, more than 4 trains an hour. Only every 30 mins.? That's a good frequency. And the other times, a very good frequency. Why? Because a lot people have been asking, writing etc, that Wickham <-> Central needs faster express services, although I don't think they expected it be THAT early in the morning (0503) for the UP journey. YES, it is a good enough frequency. And does the Leppington line stations still get only a handful of passengers? From past experience, there was a non-negligible number of passengers boarding northbound Central Coast trains at Eastwood. If there is no time gain, I don't think it makes sense to skip Eastwood. No it isn't. What is acceptable in Newcastle isn't acceptable for Sydney. There is a need for more transit mode share in Sydney and particularly for Parramatta workers - the jobs will follow. The need is much lower in Newcastle. The Leppington line isn't really the issue. It's the Cumberland line. stupid_girl wrote: From past experience, there was a non-negligible number of passengers boarding northbound Central Coast trains at Eastwood. If there is no time gain, I don't think it makes sense to skip Eastwood. My guess is to reduce the passenger loads on 4 car Central Coast trains which can be be overcrowded upon leaving Strathfield but then half empty after Hornsby. I agree they might as well keep the stop if it's no faster to skip. This change is just adding more dwell time and padding into the timetable. I've read before that Central Coast via Gordon trains stop at stations like Wollstonecraft because it's not any faster to skip them. However I've also read that the Flyer skips Epping, Eastwood and Hornsby to provide guaranteed seats to Central Coast and Newcastle customers (and not suburban passengers). It's only a 1 minute faster trip despite skipping those 3 stations, and it often crawls through Hornsby anyway. If that's the real reason, I think it should be a 'pick up only' stop. Liamena wrote: The proposed new timetable for the north shore line on weekends, has swapped around the timing of the trains to berowra, and the trains which terminate at hornsby. The trains which terminate at hornsby will arrive there at 21 and 51 minutes past the hour, and the trains going to berowra at 6 and 36 minutes past the hour. This means that the all-stops to berowra trains won't be running right behind the central coast train any more. I suppose that in theory, the 2 minute change from the north shore line to the central coast line will still be possible. It's 3 minutes in the current timetable, 2 minutes in the new timetable. I didn't actually realise how nicely the current timetable is set up for people on the Hornsby to Berowra line to connect to and from the Central Coast trains on weekends. It seems like a pretty significant change and a backwards step to remove those connections. Perhaps they were causing flow on delays being closely timed together? I hope Transport NSW has the old and new timetable trip planner in parallel, so you can compare your trip on the old vs new timetable side by side. I agree. I watch them every day. On weekends there are a significant number of passengers from the North who exit the Intercity trains at Eastwood because of the large food retailing and restaurant/café scene. It's a major attraction. They then obviously return later in the day. Now they may well be coming from Hornsby or Epping (by Intercity trains), but I suspect that many are coming from further afield. Perhaps Opal has more accurately identified the origin of those passengers to justify skipping Eastwood. One also has to bear in mind that currently on weekends, there are only 2tph for Suburban supplemented by 2tph Intercity serving Eastwood (similarly Epping on the Main North, although Epping also has the additional 4tph to and from Chatswood via the ECRL). With the introduction of 4tph for Suburban services on weekends from Epping to the CBD via Strathfield which includes Eastwood under the new timetable, the thinking might be that there is no further need for Intercity trains to stop at Eastwood to maintain a 4tph service. As I have mentioned many times on this site, Eastwood is a much larger retail/commercial centre than Epping and although Epping is a junction station with more services, that's no reason to maintain the status quo and refrain from improving the frequency of services for Eastwood. However, if there is no improvement in travel times for CCN services, then what is the point of skipping Eastwood? All it does is inconvenience those from the North who will now have to change at Epping to reach Eastwood. Northbound, there is no time saving at all. Southbound, most citybound CCN services on weekends will actually take 13 min from Hornsby to Epping in the new timetable, up from the current 10 min. This is because the CCN service would otherwise catch up to the Epping to city all stops. Journey time has actually increased by 3 minutes while stopping at 1 less stop, impressive. Hopefully not to encourage uptake of the 530 bus from Chatswood, I just gave it a go - it's miserably slow, couldn't have taken a drearier route and patronage on this thing is dead, a few months after its inception. Anyways, this thing is, as others have pointed out, still in draft mode. I suspect we'll still see some changes before the final version comes out in a month or two. Transtopic wrote: However, if there is no improvement in travel times for CCN services, then what is the point of skipping Eastwood? All it does is inconvenience those from the North who will now have to change at Epping to reach Eastwood. 13 minutes!? I've been on a late running train that's done that segment in about 7 or 8, and made up time. On weekends and late at night it's not uncommon for Central Coast trains to arrive a minute or two early at Hornsby. I hope someone makes a comparison site for this new timetable to highlight changes in journey times like this. Edit: just looked at TripView and right now there a train that left Hornsby 3 late, was 1 late at Epping and 1 early at Strathfield. Quite so. The 39 minute interval between consecutive services in the middle of peak hour is very poor. And that is not just for Leppington. For anyone from the Campbelltown line or Liverpool or Cabramatta or Fairfield or Guildford or Merrylands, as well as Leppington, they are all affected by this poor schedule of the Cumberland line right in the middle of the morning peak hour. 39 minutes is pathetic. Then the poor connections from the Campbelltown/Macarthur trains, at Glenfield, 12-16 for the three trains morning peak hour commuters are mostly likely to want to take, well that just adds to the problem. andy_centralcoast wrote: Edit: just looked at TripView and right now there a train that left Hornsby 3 late, was 1 late at Epping and 1 early at Strathfield. Yeah, I think I might have been on that one. Hit 105 km/hr at Rhodes, according to the GPS. The return trip sucked quite badly in contrast. If nothing else, I hope they at least fix the spelling. Is anyone aware of any other changes, negative or positive (there are a couple) in case I missed anything or got any of the above totally wrong? Burwood is the place with the 8th largest daylight population in Sydney, and the 17th busiest station on the Sydney Trains network. It may have gotten busier but I can't seem to find station exit / entry stats for recent times.